Do you remember gathering up the wild daisies, and playing the ‘he loves me, he loves me not’ game, by picking the petals off one by one? Now that I think about it – what a terrible waste of pretty flowers! LOL! But we were just kids back then. We thought wildflowers would always be around. Well, the new Daisy Delight stamp set is perfect for bringing back memories of those carefree childhood days! We won’t go to the angst of the teen years – nobody needs to go back there! 😉 To make it even easier to enjoy, there is also a Daisy Punch, which you can buy as a Bundle with the stamp set, and save 10%! And you’ll want to save on the bundle, because you WILL want the entire Delightful Daisy Suite of products, trust me. The stamp set and punch have beautiful coordinating Delightful Daisy Designer Series Paper, and you can also get the Delightful Daisy cardstock pack for only $10. It has the coordinating Calypso Coral, Old Olive and Pool Party colours that are in the DSP. The beautiful Faceted Gems in Clear and Gold are perfect for the flower centers. And finishing off your project is the 1/4″ Double-Stitched Ribbon, in Daffodil Delight. To view the entire Delightful Daisy Suite of products, you can CLICK HERE for the page in my online store. How is this for a cheerful card?! I love the Daffodil Delight and Night of Navy colour combination. This card came together very quickly – which is perfect when you have a lot of thank you cards to make! The card base is Daffodil Delight cardstock, with a panel of Whisper White on top. Next, I layered the top 1/2 with a piece of the Delightful Daisy Designer Series Paper. 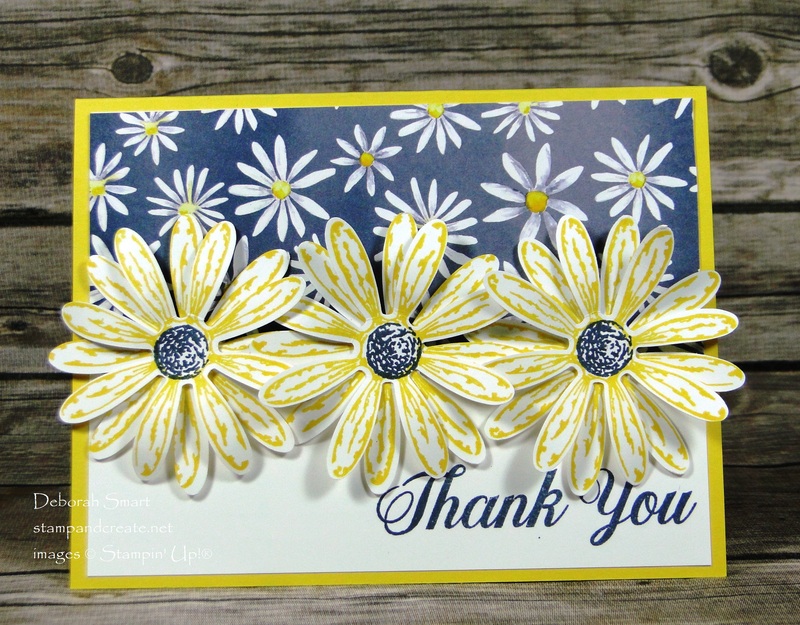 The ‘thank you’ sentiment is from the Daisy Delight stamp set, inked in Night of Navy on the bottom of the card. 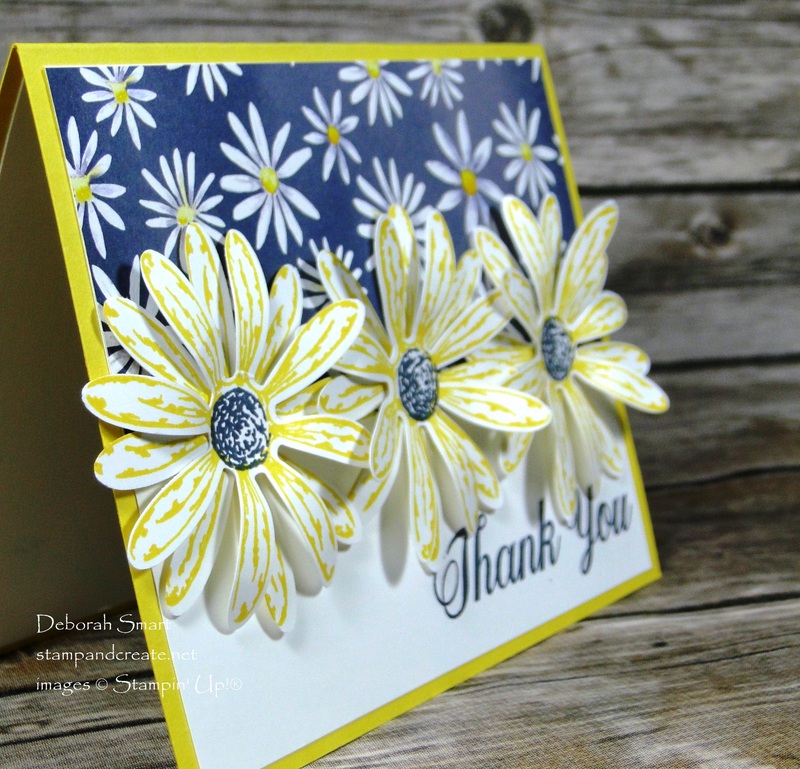 With Daffodil Delight ink, I stamped and punched a total of 6 daisies, and added a Night of Navy ink center to each one. Each daisy was punched using the Daisy Punch. Layering 2 daisies for each flower, I took my Bone Folder and using the edge of it, gently shaped the petals for dimension. Each flower was then added across the middle of the card front. You can see how much dimension you can create by layering and shaping the petals! Ordering your own Daisy Delight Bundle is super easy! Just click on the images below, and you’ll be taken to my online store. You can order from there, or if you prefer, contact me directly & I will place your order for you. This bundle is super popular; in fact it was not orderable for about 3 weeks due to being out of stock! But we’ve got more in stock now, so order yours before they’re gone again! Previous Previous post: Daisy Delight Bundle Now Available! Next Next post: Are You Up For a Challenge?